Heard of Tagged? Back in 2005 it was a teenager-only social network, catering primarily to U.S. high school students as Facebook charged through the college crowds. By 2007 they were profitable and worth over $100 million. Just one problem though. Facebook eventually started letting high school students in, and then everyone else. Tagged responded by opening up to everyone, too. But by mid 2007, CEO Greg Tseng tells me, Tagged knew it was in trouble. Bingo! Facebook isn’t big on helping you meet new people. You can search by name, and you can click on friends of friends, but you can’t just find new people you aren’t already connected to via someone else. At Tagged, people were using filtered search to meet people. For sharing activities, dating, or whatever. “We focused on being the best place to meet new people for any social reason,” Tseng tells me. Users definitely agree. 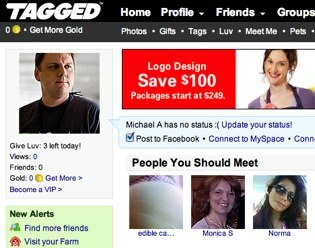 In 2007 Tagged had 20 million active users. Today they’ve hit 100 million. 1/3 to 1/4 visit the site each month and the site has 5 billion monthly page views. And they’re spending money. Virtual gifts. VIP accounts that let you do things like see who’s viewing your profile for $20/month. Revenue has grown to $30+ million, and Inc. named them one of the 500 fastest growing companies two weeks ago. 2011 revenue should be $50+ million, says Tseng.